Kitchen cabinets are more than just storage. They’re the furniture of the kitchen, the main focal point. They set the mood and the vibe, and they reflect your personality and style. While stock cabinets are available in myriad colors and styles and can certainly fill a space, custom cabinets have distinct benefits over the pre-fab variety. Here are three of them. 1. Custom cabinetry can be built to fit any space. For awkwardly shaped kitchens or those that are very large or very small, custom-built cabinets can save the day when stock cabinets won’t fit properly. Custom-built cabinets can be made to fit perfectly on any wall, in any height and in any configuration. 2. The design options are endless. When you choose custom cabinets, you call all the shots. You choose the dimensions, the materials, the colors, the finishes and the hardware. Custom cabinets are designed to complement your lifestyle and meet your unique design, cooking and storage needs. 3. Custom cabinetry offers customizable storage options. Storage is always at a premium in a kitchen. Custom-designed cabinets let you configure the cabinetry in a way that gives you optimal storage space. You can also have pieces designed to accommodate specific items, such as a a huge selection of spices or small appliances. At DreamMaker, our designers love creating kitchens that solve our customers’ problems and make their lives easier and more enjoyable. Custom cabinets are just one option for making dreams of a functional kitchen a reality. For some kitchens, semi-custom or stock cabinets are an ideal choice. And for kitchen remodeling on a budget, DreamMaker can even re-face existing cabinets to update and transform a kitchen at a lower cost. It’s all about your wants and needs. 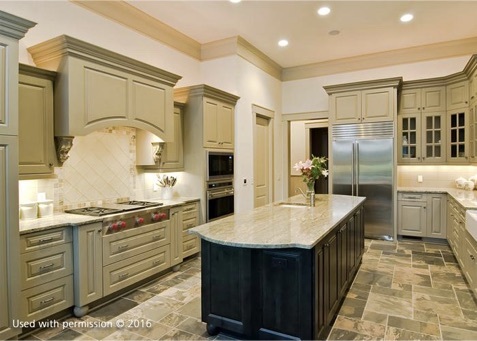 If you’re looking for a home remodel company that can help you navigate the wide, wonderful world of cabinetry, DreamMaker Bath & Kitchen of Northeast Suburban Chicagoland is an award-winning contractor with talented designers and decades of experience. We’d love to give you the kitchen of your dreams. Call (847) 327-0203 or submit our online form to start a conversation!